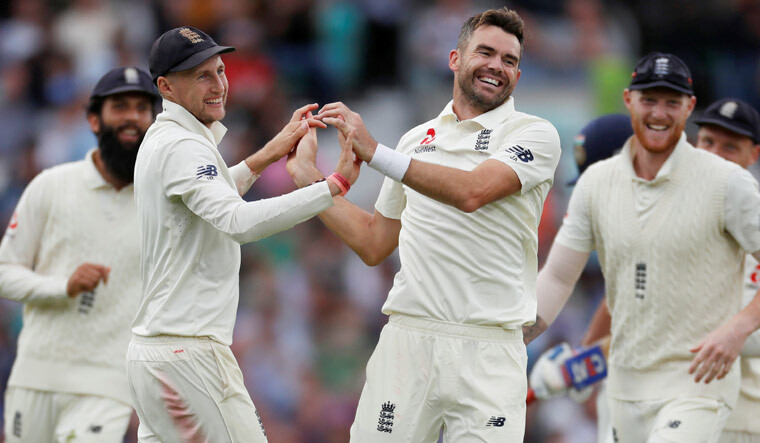 India's susceptibility to quality swing bowling once again came to the fore as they struggled to reach 174 for six after England's tail wagged considerably to give the hosts an upper hand on the second day of the fifth and final Test. India still trail England by another 158 runs with four wickets in hand and three full day's play remaining in the match. K.L. Rahul and Cheteshwar Pujara made identical 37 to stitch together 64 runs for the second wicket to stabilise the Indian innings before the English bowlers got back into the groove, picking up crucial wickets when it mattered. Rahul looked set for a big score before Curran went through his defence with a nearly unplayable delivery in the 23rd over. Just like previous matches, India skipper Virat Kohli (49) looked in great nick and seemed determined to take his side out of troubled waters with positive intent. He hit six boundaries during his 70-ball knock and made batting look easy even as his colleagues struggled. Vihari looked out of sorts against Stuart Broad's (1/25) inswingers initially. The bowler had two LBW shouts against the debutant—the first of which looked out on replays but England didn't opt for DRS. Earlier, replying to England's total, the visitors made a poor start and lost opener Dhawan early, out trapped lbw by Broad in the second over. Rahul, though, batted with more freedom than in the earlier Tests, and looked to play his shots as he hit four fours. Starting at overnight score of 198 for seven, the Indian pacers found some lateral movement in the morning but were unable to get the English tail-enders out. India reduced England to 181 for seven at one stage on Friday, but now the game seems to be slipping away from the visitors.